Apple [AAPL] has announced that it will be opening its retail stores in the UK early for the launch of the UK iPad. 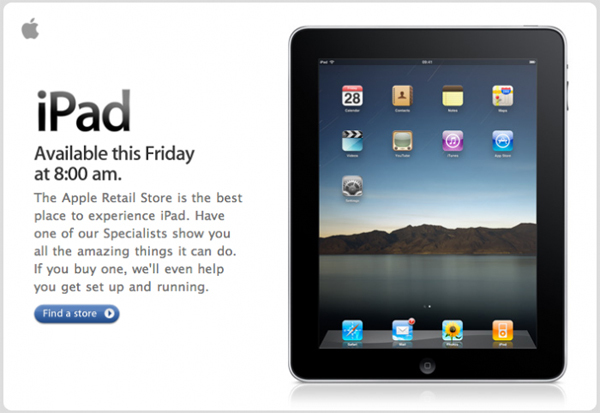 Customers in the UK will be able to purchase the iPad from 8.00AM on Friday the 28th of May 2010. When the iPad was launched in the US it was a great success, and Apple have sold a serious amount of iPads since it went on sale, will it be as popular in the UK? There have been a number of reports and surveys saying that the iPad won’t be as popular in the UK, due to its price, but we think it will be a success in the UK, as Apple have already changed the shipping date for pre-ordered iPads which could mean high demand for it. We would like to hear from our readers in the UK, will you be buying an iPad this Friday ?